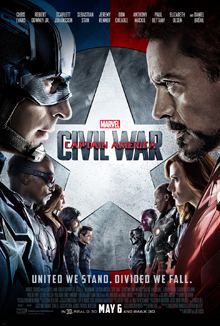 After the abysmal ‘Age of Ultron’ I’ll forgive myself the lack of excitement coming up to the release of ‘Civil War’. Whilst this is strictly a ‘Captain America’ movie (and the follow up to the terrific ‘The Winter Soldier’), the addition of several other superheroes made this feel like a further ‘Avengers’ outing in all but name. Thankfully, gone is Joss Whedon’s ‘jokey’ banter, replaced by the snappy dialogue as written by Christopher Markus and Stephen McFeely and directed by the Russo Brothers, best known for ‘The Winter Soldier’ and their fine work on the TV series ‘Community’. ‘Civil War’ is not perfect, but it gets much more right than it gets wrong and one of its strongest points is how it handles its large ensemble, introducing new characters successfully whilst allowing sufficient screentime to previously established characters. I think the main thing I liked about ‘Civil War’ is how it primarily takes a character driven approach to the narrative with the plot playing second fiddle. This works especially well now that we’ve spent several hours across several films with most of these characters and that background character development adds a certain weight and power to the decisions made throughout the film. Chris Evans is one of the finest performers in the Marvel universe and he is excellent throughout ‘Civil War’, whilst Robert Downey Jr delivers his best performance since the first ‘Iron Man’ with a more serious approach after the dreadful rent-a-quip he’d became in ‘Age of Ultron’. It’s good to see Paul Rudd back as ‘Ant-Man’ after his fun turn in the solo movie and Chadwick Boseman and Tom Holland both nail their introductions to the universe. Despite my misgivings about the handling of the Spider-Man franchise and Andrew Garfield, the introduction of Tom Holland’s version undoubtedly works here. He’s a more youthful version of the character and his introduction here will hopefully mean we’re not in for another origin story further down the line. The film’s narrative is split into two primary plots. Firstly, the Civil War of the title as the superheroes team up in different factions surrounding the Sokovia Accords, which seek to establish a governing body to monitor the superhero population. The secondary plot is more traditional, focusing on a terrorist who wants to defeat and destroy ‘The Avengers’. This plot is helped significantly by the casting of Daniel Brühl, who is understated and credible in a role that could be over the top in the wrong hands, and it makes a change from some of the recent Marvel villains to have something more grounded. Keeping with the grounded theme, the film isn’t short on big fight sequences but for the most part it avoids big city battles with massive destruction, and like the recent ‘Batman v Superman’ film it starts to acknowledge the consequences of these events on the general population. ‘Captain America: Civil War’ is a strong outing from Marvel, delivering an entertaining action packed drama with some real underlying stakes for its characters. Continuing some of the good work from ‘The Winter Soldier’, the film deals with weightier themes and focuses more on character and less on explosions to tell its story, and I really enjoyed it.